Our annual events series, Downtown Brooklyn Presents, kicked off last Saturday with a (finally!) sunny Earth Day Block Party at Albee Square. 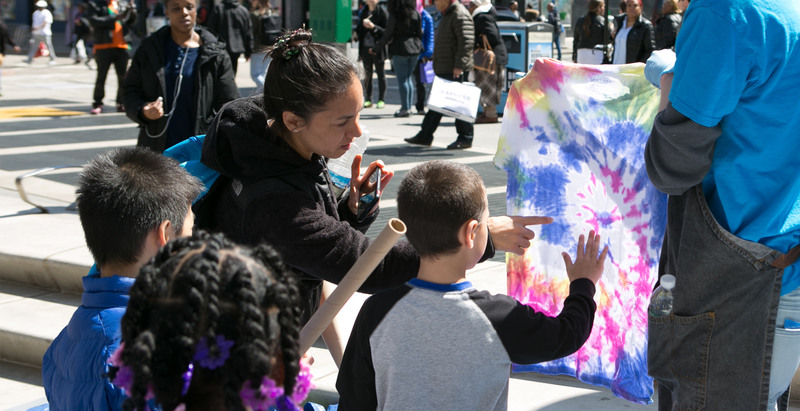 It felt as though the entire neighborhood came out of hibernation to fill the plaza as we hosted a variety of activities, ranging from dance classes, to t-shirt tie dying, to earth-watching, and tons in between. The day also celebrated Car Free NYC, and, to demonstrate, Albee Square West was closed to traffic, allowing pedestrians to roam free, and Bike NYC to offer kids bike lessons without fear of vehicular interference. 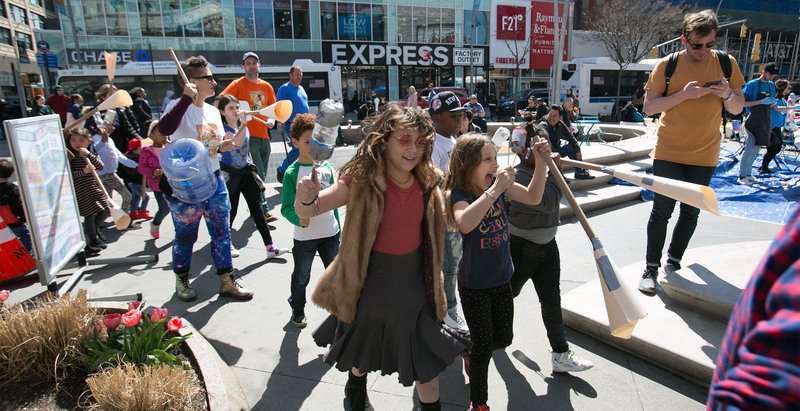 For the musically-inclined, local eco-friendly troupe Bash the Trash performed, showed the kids how to make instruments out of recyclables, and then led a parade! In between jam sessions, partygoers also learned to tie dye their clothes and plant seedlings. The Uni Project brought an entire portable library, with a special exhibit on birds. 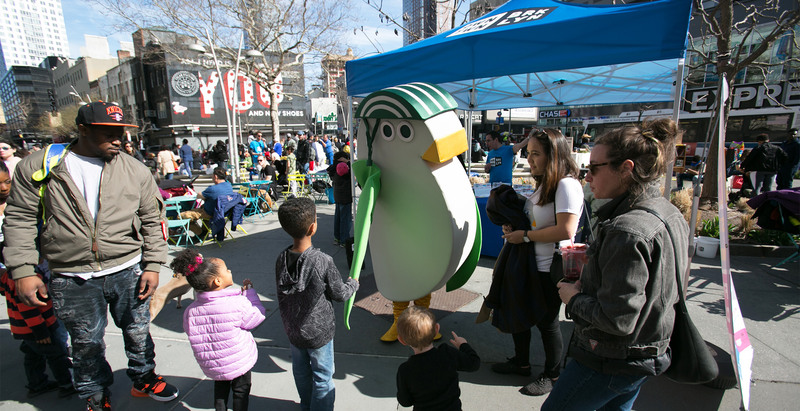 For those preferring the “real thing,” we had a special appearance from GreeNYC’s mascot, Birdie, to spread the good word and shake his tail feathers during a dance class with the Dodge YMCA. Partners, City Point, offered additional activities indoors, including the popular “biggest, baddest maze” made out of 100% recycled material. Brooklyn Beet CSA, a local community group, brought along a bountiful garden to spread the word about local farms and community-supported agriculture. 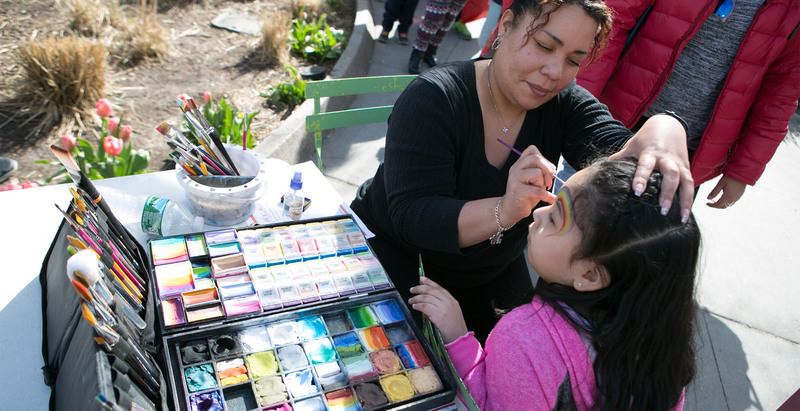 The lush greenery provided plenty of inspiration for the face painters, who helped to celebrate a great day with splashes of spring color. NYU Tandon School of Engineering took a different route, helping visitors appreciate the earth with an exciting virtual tour from space using the same software as is used at the Hayden Planetarium. Throughout all of the activities, DJ Mike provided the party with favorite tunes, and even found a dedicated fan club to dance by his station all afternoon. 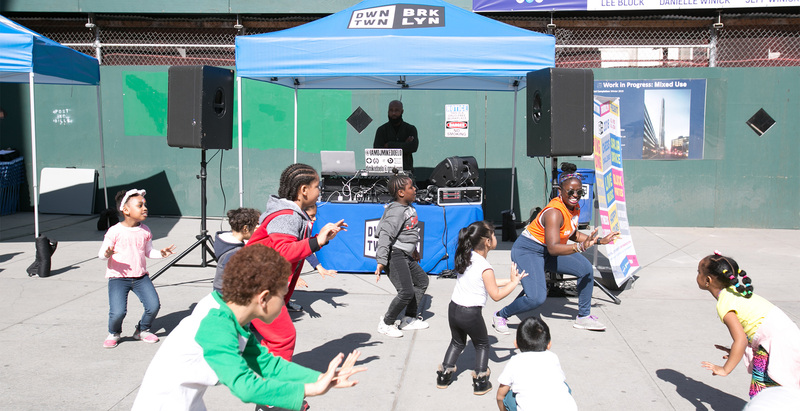 Downtown Brooklyn Presents continues with more free events all year long, including fitness classes, salsa dancing, outdoor movies, meditation, ping pong, live music, and more! Keep an eye on our website for all of the details, and sign up for our newsletter for a fail-safe way of staying informed. Stay in the know! Find us on Twitter, Instagram, and Facebook. Tag us and we’ll share your #DowntownBrooklyn pics.